My daughter received the Spin Master Paperoni 3D Pig Kit as a birthday gift. She was excited to try it, and it seemed like a fun, easy craft she could do on her own. She carefully opened it, we looked at the instructions, and she even got a little bowl for all the little rolled up paper pieces. The 3D kits come with a hard plastic form covered with a self adhesive coating, and a pack of 350 tiny colorful paper rolls. In theory all you need to do is place the Paperoni pieces on, and voila! You have a cute critter! She worked at it patiently, giving up on the tweezers fairly quickly, and placing each tiny roll by hand. And they started falling off. And she put them back on. And more would fall off. She’d get a bunch on, try to place the ears and eyes, and again, pieces would fall off. 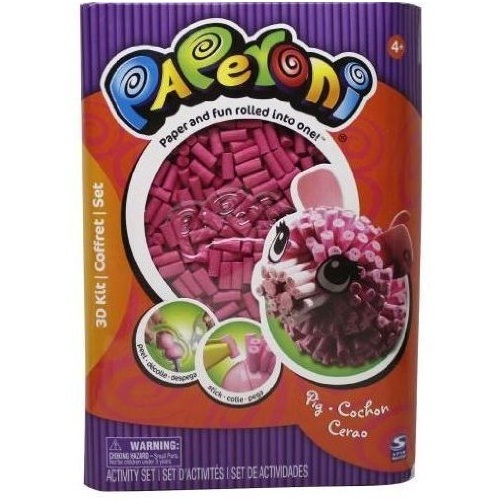 The Spinmaster Paperoni 3D Pig Kit retails for $7.99, and there are several other 3D kits available including elephant, monkey, cat, poodle, tropical bird, and tiger. Paperoni’s also come in 2D kits, using flat templates instead of the 3D forms, and those might stick together better. Recommended for ages 3 and up. But, don’t waste your money. Unless Spinmaster can improve the adhesive, Paperoni 3D is no fun at all. My daughter wanted a Nintendo DSi for her 8th birthday. 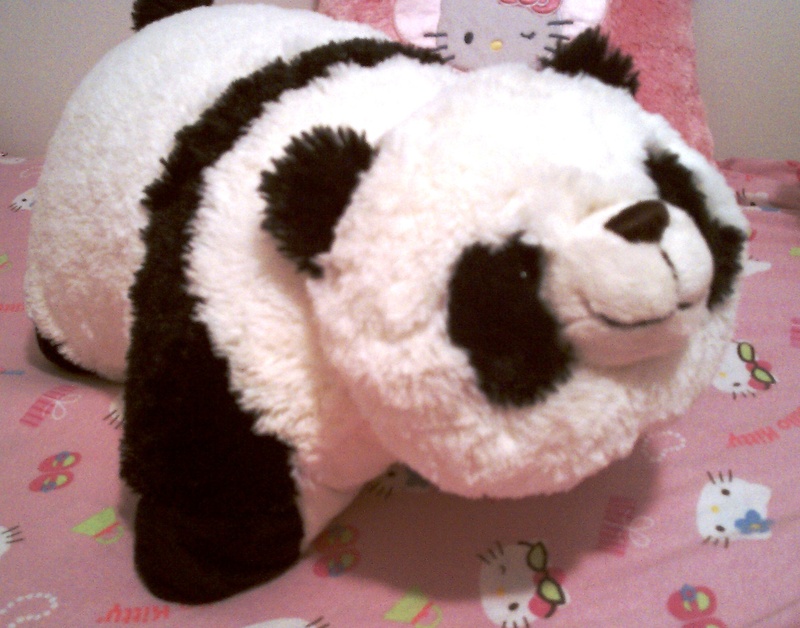 I bought her a My Pillow Pets Panda instead, and crossed my fingers. She’d seen the TV commercials and was smitten. But I was worried. Would she be happy? Would she be disappointed? Would it live up to the hype? She tore open the wrapping paper, and she loved it – with a big hug and a smile. Made of super soft and cuddly chenille, Pillow Pets are adorable. Fasten the strap closed, and it looks like a regular stuffed animal pet, standing on 4 legs. Undo the Velcro strap, and it flattens out like a pillow. The strap also includes a little fabric flap that covers the Velcro hook strip, so it won’t tangle in your hair – a nice touch. Pillow Pets come in 2 sizes: 18 inch for $24.99 and up, and 11 inch for $16.99 and up. (Although prices on Amazon range from under retail price to much higher.) A menagerie of animals are available, including: penguin, lavender unicorn, monkey, cow, panda, dog, dolphin, lady bug, bumble bee, frog, lamb, turtle, bunny (purple, pink, or cream), horse, bear, duck, moose, pig, cat, dalmation, elephant, alligator, zebra, giraffe, tiger, whale, lion, hippo, polar bear, and puppy. Machine washable on gentle, fluff dry (although says not recommended for the dryer); conforms to ASTN and EN71 regulations. I ordered from Amazon, for $24.99, and as I was ordering another item, I qualified for free SuperSaver shipping. They warned it would ship late, but it actually arrived surprisingly quickly. Perfectly sized for the car, or trips to grandma’s house, chenille plush Pillow Pets are a fun toy, even if they are a little pricey. With times being tight, I’m determined to stick to our budget – which is hard for my kids, and even harder for me. Still, I’d rather pay $25 for a Pillow Pet, than for a Zhu Zhu Pet! And I’m keeping the DSi on her wishlist. Maybe for Christmas. Recommended for ages 3 and up. It also seems appropriate for younger ages; the only thing that might be an issue – the hard plastic eyes.